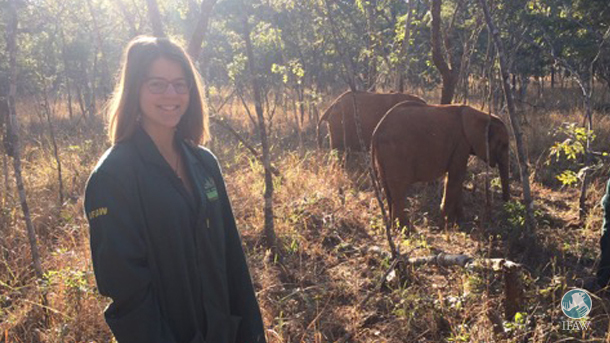 When I first arrived at the Kafue Release Facility on the 14th July, I didn’t truly know what to expect of the work involved in my volunteer placement. However, I was immediately exposed to camp life and received training on how to conduct research for the Behavioural Observation Study (BOS) during my first few days. The study takes place at Lilayi Elephant Nursery in Lusaka and at Kafue Release Facility in Kafue National Park with the aim to understand the behavioural development of orphaned elephants. The BOS observes herd composition, general activity, as well as individual behaviour and social interactions, allowing the team to identify any abnormal behaviour so that efforts to ensure the orphans’ recovery can be initiated as soon as possible. The longer term goals involve looking at release success and informing management at various stages of the project. Gathering data for the BOS was my main priority as a research volunteer, therefore it filled most of my schedule. During my time at the Elephant Orphanage Project (EOP), I learned a lot about elephant behaviour and the effort of rescuing, rehabilitating and finally releasing orphaned elephants back into the wild. I was amazed by the post-release tracking of the release-phase elephants; at the moment, four elephants of the release herd have a GPS collar fitted. The two oldest, Chamilandu (11 years) and Batoka (9 years) have started to explore their wild surroundings on their own, without the rest of the herd, but often staying with each other. During lunchtimes and evenings when the rest of the herd is in the boma, they often decide to stay outside, which is an important step towards their release. This means that observing them for the BOS is not always possible, but their movements can still be monitored thank to their GPS collars. I have witnessed members of the EOP team checking on Chamilandu’s and Batoka’s movements several times to see if they are integrating well in their wild environment and to ensure their safety. Contributing to this, I was involved in research that worked out the amount of time they spent with the herd in one month to find out the percentage of their attendance with the rest of the herd. This percentage shows how independent they already are and classes what stage they are in their rehabilitation. As I stayed at the Lilayi Elephant Nursery for my first three days in Zambia, travelling to Kafue Release Facility afterwards, I could see how the keepers slowly reduce the contact with the elephants to best prepare them for their release in the years to come. This is supported by EOP’s hands-off policy, which means that only the keepers are allowed physical contact with the elephants, and only when required. The visiting area for tourists is situated in a place where they can see the elephants but the elephants are not overly aware of them. As a research volunteer, BOS is not my only task. Since I have been here, I have gained a greater insight on all aspects of the project, including preparing the specialised milk formula for each of the elephants that are still milk -dependant, which is based on their health condition and requirements. Moreover, I was involved in a new study concerning essential oils in order to learn more about how animals heal themselves and how those oils can be used when there is no vet immediately available. Since this study has only been an idea so far, I was able to learn some basic knowledge on an interesting topic and create a first concept for the study based on this, which I really appreciated. Every time I hear or see Chamilandu and Batoka in the river outside of my tent, I am proud that I can be, at least for a short period of time, a part of all those orphaned elephants’ way back into the wild.